Sleek new design, lessons recommended just for you & so much more. Here's what we've been working on. Q: Why is dough another word for money? 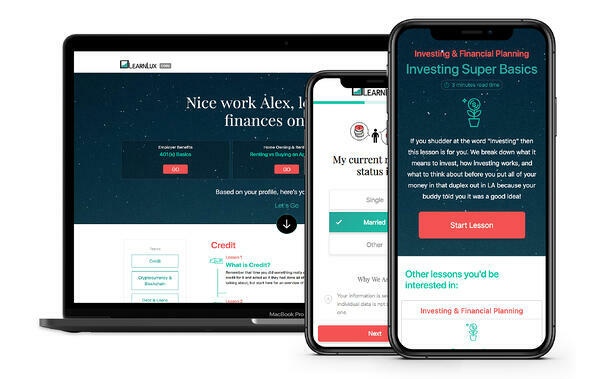 Q: What’s new in LearnLux to help you hit your financial goals in 2019? All (corny) jokes aside, we’ve been hard at work on LearnLux, making things more interactive, easier to use, and all around prettier for our current and future employer partners. Our app is now sporting an updated design. Lessons and details pages have a sleek new look -- smooth, flat & white like that bougie drink at Starbucks. By popular demand, lessons are now broken down by chapter. Skip right to what you want to learn most to save time & learn more, like in the Investing Super Basics Lesson. Busy all day? Load up LearnLux on your phone while you're stuck on the Red Line, and swipe through the lesson on Tax Time Deductions to save some major $$ this April. The entire website is now responsive. Welcome to 2019. Based on your profile, we'll recommend lessons and chapters that we think you’ll like best. Already in the lesson flow? Let us recommend what lessons you should learn next. We'd love to hear your feedback! If you have ideas for a new lesson, thoughts on tools you'd like to see or anything else that would make your experience better let us know. You'll find a Drift Chat on our website (when you're on desktop) so feel free to drop us a line on there, or book 30 min with our team for a deeper dive into features, designs and more.